The name Palenque is not a Mayan word, but the Spanish word for a palisade or fence and comes from the name of the nearest town. The original name may have been Na Chan Kan (city of snakes). 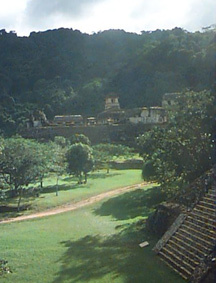 Palenque is a fairly old site with its height during the Mayan Classic period from about AD 300 to 800. Few ruins have been written about more than Palenque. It feels somewhat like a "lost city" and in many ways it still is. In the state of Chiapas, it sits amongst jungle, rivers and water falls and borders the Lacondon Forest. When you visit, you will note native Lancondon Indians selling handmade bows and arrows and other items. They can be recognized by their long white shift-like attire and long hair. Hours: 8-5. Allow at least four hours to visit. We spent an entire day and felt we could have spent more as there are trails in the surrounding forest that lead to barely uncovered ruins. Palenque's isolated location may leave you alone much of the day. We found it hot and humid and shrouded in clouds most of the day. Late in the day the sun finally peaked out and lit the ruins. Palenque is somewhat out of the way, but is worthwhile. We would rate it as one of the top 5 ruins to see in Mexico. It can be reached by highway, special excursion planes from Villahermosa, Merida or via ADO busses from larger cities such as Chetumal, Cancun and Escarcega.. The first time we flew from Mexico city to Villahermosa, then a driver took us to Palenque. The second time we drove from Mayan Beach Garden. There are quite a few hotels in the area, so you won't have any trouble finding a place to stay. Palenque is different than any other Mayan site, not only for its vast carvings, but for the interesting architecture of its palace. 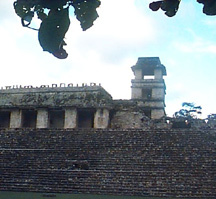 A focal point of the palace is a four story tower that is not found in any other Mayan site. You are not allowed to climb up into the tower, but the palace is blessed with extensive reliefs, carvings and adornments that make it very interesting to visit. The many inscriptions found in various places within the city reveal information on Palenque's rulers. The first king of Palenque supposedly ruled from 993 BC and all subsequent rulers were revered as being godlike. Divine attributes of the ruling class include various deformities, including clubfoot, enlarged skull, perpetuated by marrying within families. Interesting among sculptures found on the site are carvings of Chan-Bahlum, who was born with 6 toes on each foot and six fingers on his left hand. Other sculptures who images of self-mutilation. Temple of the Inscription stairs seen at the right. When we were there, they offered the opportunity to climb down into the inside of the largest temple (the Temple of the Inscriptions) to see the famous Tomb of Pacal. In order to view the tomb, you must climb 67 steps up to the top of the temple, and then climb 67 steps back into the temple. While this doesn't sound too bad, the steps inside are slippery lime steps and each one is almost 18 inches -- and the temperature inside is hot and steamy. It's worth it, however, because once there, you can view the red painted tomb and the incredible sarcophagus lid. Unlike most treasures, the lid was far too large to remove from the tomb. We were told by a guide that the red paint inside the tomb is poison and those who attempted to try and steal treasures from the tomb would die. This indeed happened more than once. The last time we were there they had closed the tomb for additional excavation, and I don't know if it has been reopened. Palenque is a great place to explore. There are trails that wind through jungle and then open up to view partially excavated buildings. Not too far are pools and waterfalls where you can swim. Also included in the site is a spectacular museum with artifacts taken from the site. The museum includes exquisite jade jewelry and the world's largest collection of Mayan ceramic incense burners and fabulous reliefs. Unlike many sites, Palenque has few stele. Instead, there are carvings and writings all over the walls. Many are in poor state, but a significant amount are preserved as in this mask shown to the left.